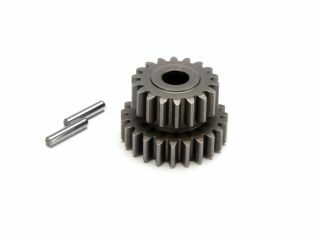 This HD Drive Gear is a high performance replacement for the 86097 Drive Gear. It is made from tough machine cut steel for extra durability over the stock part. It will fit the Flux, RTR Savage X 4.6, Savage X SS and older Savages with the 2 speed transmissions. This part is not compatible with 3 speed transmissions. Any one who has the stock drive gear in the savage flux definately wants to replace it with this gear as the stock one will not last more than a few runs. its much harder than stock one and once installed should not have anymore problems. works great.